Giveaway Closed. Congratulations to the Winner, Stephen Young. Late last year, I posted a review for some lovely Charles Eames style DSR chairs from VOGA which still look stunning in my dining room. Today, I’m thrilled to be working again with VOGA, this time offering a replica Charles Eames RAR Rocking Chair in any colour of your choice worth £132, as a prize to one lucky reader. The Charles Eames RAR Rocking Chair is an iconic design and the perfect fusion of traditional and modern, with its glossy plastic and fibreglass shell and wooden curved rockers. The curved seat is moulded from fine quality fibreglass and plastic and comes in a choice of colours to suit every home. The Eiffel tower inspired legs are a unique feature of Charles Eames’ style of design and offer uniform support for the body’s weight. The rockers have a smooth motion and are available in oak wood. Would you love this in your home? Perfect for any room and any purpose. Pop it in the corner of your living room as a statement chair and extra seating. Why not use it at your dressing table, or as a feature piece in the bedroom, or of course, as a rocking chair in a baby’s nursery. However you choose to use it, the replica RAR rocker will add a touch of contemporary style to your home. Note: This is a VOGA reproduction of a design classic and delivery times can vary. Do take a look at the VOGA website to find out more about the chair and other iconic designs for your home. If you want to treat yourself, VOGA has also given me some discount codes available to any readers to use straight away. Discount 1: £15 off when you spend £150 – Use code LOVE15 at checkout. Discount 2: £30 off when you spend £300 – Use code LOVE30 at checkout. Both codes are valid until March 2nd 2015.
and then leave a comment telling me you’ve done it. 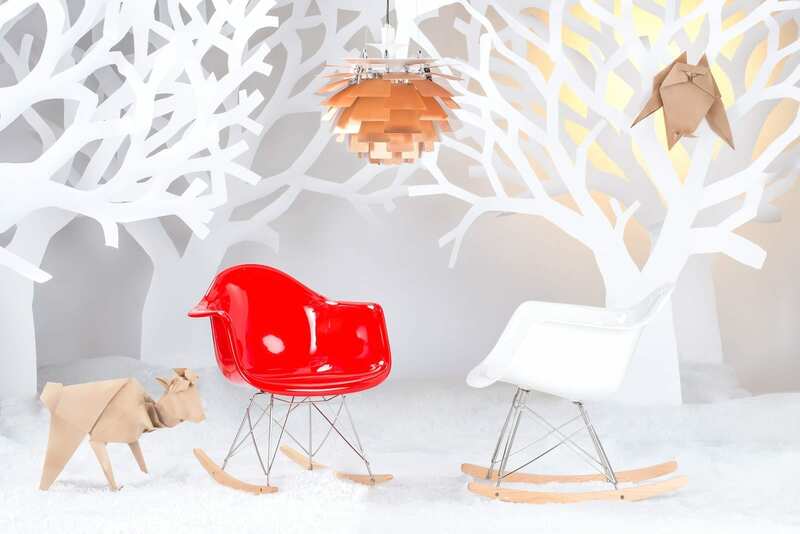 The prize is a replica Eames RAR Rocking Chair from VOGA in plastic worth £132. There is no cash alternative. Open to UK residents aged 18 and over, excluding employees and relatives of Jen Stanbrook and VOGA. The prize will be given direct from VOGA allowing for delivery timescales. Thanks for the competition, I’ve tweeted it out there. So good luck to all who enter! I tweeted!! Would love this. I’ve tweeted thanks so much! Have left a tweet for this super stylish chair – lovely. I’ve tweeted – hope I win! Tis done for you! What a great prize! I’ve tweeted, subscribed and visited the Facebook page – thanks! All done. LOVE the chair! I tweeted! Make sure I win!!! hello ive tweeted great competition !!!! I have retweeted, love the chair! Tweeted my entry, thank you! done and completed. thank you. Amazing design that has stood the test of time! Entered 🙂 Fingers crossed, beautiful chair!! I have tweeted. Hope I’m lucky! Tweeted – great prize! Fingers crossed! visited the VOGA facebook page! I have tweeted! Fab competition! Love the chair & have tweeted. have tweeted! thank you for this opportunity, jen. I’ve tweeted – thank you – fabulous! I’ve Tweeted. Would love to win one of these. I tweeted! Thank you for the chance to win! Done 🙂 Very nice chair! I receive the Love Chic Living newsletter. All done – Fantastic prize! tweeted! Thanks for the chance… fab prize!! Done – love this chair! Thank you, I have tweeted. I have tweeted the message. I have followed VOGA on Instagram. I have followed @lovechicliving on Instagram. I have visited VOGA UK Facebook page and also Liked at the same time. tweeted thanks rocker is awesome !! I have Tweeted, thanks, it is a lovely prize. I’ve tweeted and followed Voga on instagram. tweeted and followed and would be delighted to win one of those chairs, then i could rock as I crochet away! Tweeted – fingers and toes crossed! I have tweeted the message. Would love this chair. ALL DONE 🙂 fingers crossed..
Have sent tweet re: fantastic Eames chair. Retweet all done! Great competition. Tweeted and signed up for your newsletter! Have tweeted! Would love this! tweeted and following on twitter and following both on instagram as Emstargally. have subscribed to newsletter too. I have tweeted 🙂 lovely prize, thank & good luck everyone! Love the rocking chairs, such a fab idea! I have tweeted! I am following you both on Instagram username: nancycullinane im also subscribed to your news letter and visited their page on Facebook!